On Wednesday, January 23/2019 at approximately 9:00am, my Wife and I decided to go for a morning walk. We had not gone far from our apartment block, when my Wife slipped on a piece of snow-covered ice. She fell hard on her right shoulder. Since we were holding on to each other, we both went down. A young man who was crossing the street witnessed the mishap and came running to assist us. In no time there were at least four other women there to assist as well. One of the women offered to take us to hospital. I thanked her, but asked her if she would instead stay with my Wife. All the women stayed with her while I retrieved my vehicle. My Wife and I did not know any of the people that stopped to help us. Two of these women had cars which they had parked along the busy street. To those kind people, who took the time to help two seniors in their time of need, I want you to know that your acts of compassion and kindness are greatly appreciated and will not be forgotten. You know who you are, God bless you. My wife suffered a broken humerus as a result of the fall and is slowly recuperating. The selfless deeds of these strangers greatly alleviated what was a traumatic event. It confirms the goodness of people in the Sudbury area. I agree Chantel…I prefer reading these posts. Im so pleased to hear of people in Sudbury coming to someones help. Kudos to those folks! So nice to hear people help! Hope your wife gets better soon! Showing respect for one another…how beautiful is this. A great thank you for showing such compassion, in helping this couple. You have made my day. Beautiful story! Wishing your wife a quick recovery. you know, Shoutout Sudbury – you’d do well to post more stories like this instead of crap that does nothing but divide, cause judgement, breed anger and divide our community. 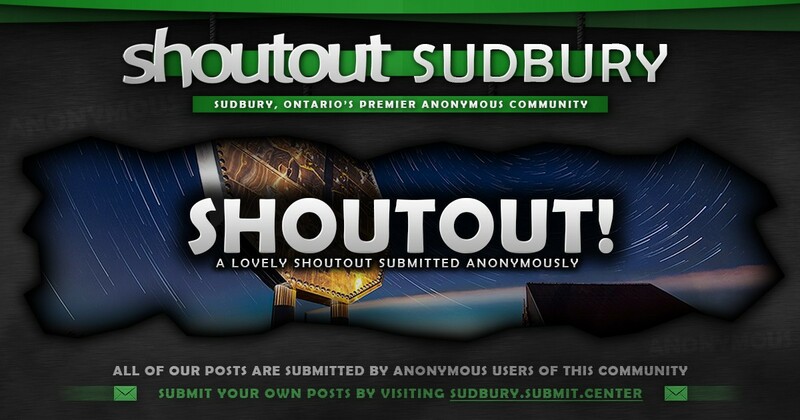 I think Shoutout Sudbury posts what is submitted. So it is about people posting more positive stories on this page. Natallica Be perhaps, but I have doubts. Posts that deliberately elicit a lot of responses (usually anger) get far more attention. Either the page is run by trolls, or they give trolls an audience. Either way, it’s wrong. Spreading the love of fellow man. Such a lovely thing to read compared to usual posts on this page. Kudos to the kind people who stopped and helped! People here really do have hearts! Bless you great people for helping! A goo news story for once, other than a break. ❤️❤️❤️ wishing her a speedy recovery. I’m so happy those wonderful people stopped to help ! Awesome . Wishing your wife a speedy recovery. Now THIS is why I stay on this page… So glad you had help of kind strangers, and hope your wife recovers well..